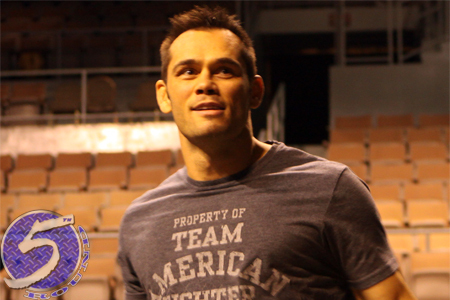 To the surprise of no one, Rich Franklin (Pictured) and Cung Le will headline the Octagon’s debut in China. UFC president Dana White made the announcement following Saturday’s “UFC on FOX 4” post-fight press conference. Franklin and Le were originally slated to tango at UFC 148, but Franklin was promoted to star in UFC 147 opposite Wanderlei Silva when Vitor Belfort was forced to have surgery on his hand. After collecting his first win in the big leagues with a unanimous decision victory over Patrick Cote at UFC 148, White all but guaranteed a healthy Le would star in the Octagon’s debut in China. There was some doubt the Vietnamese-American could answer the bell for the November 10th show because Le was in a wheelchair after last month’s scrap. Franklin, meanwhile, posted a unanimous decision win over “The Axe Murderer” in hostile territory. The Venetian Macau Resort-Hotel’s 15,000-seat CotaiArena in Macau hosts the festivities. FUEL TV will broadcast the show in North America. No other bouts have been announced for the lineup.